Is an Airedale for me? Quite often we have people ask, “What kind of dog is that?” When told it is an Airedale terrier, they comment on how cute he is. While it is true that they are cute and shed little, there is so much more to the breed and they are not for the novice dog owner. Airedales are active, rowdy curious puppies. They need positive consistent training. Airedales are very intelligent and are versatile, they learn how to do many things quickly. They are independent thinkers and have that terrier stubborn streak. Airedales are a hardworking, strong and powerful breed. And as with most terriers they also love to dig and have a high prey drive. They are active dogs that need to have their energy channeled into positive activities. They will make you laugh with their comical playful ways. They are family-friendly loyal dogs, but their energy may be too much for the small or frail. Care needs to be taken when bringing an Airedale into a home with other small pets. They are medium to large in size. Their coat requires regular brushing and grooming. Airedales require their owners to be “on their toes” and remain one step ahead of them. They need a strong pack leader to train and guide them into the well-trained, socialized athletic companion they can be. Our Valentine’s Social is again at Robin and Don Natterer’s! See our December Newsletter or our latest email for address. Our Aireboy Teddy came to us as a two year old “wild child”. He was fostered by Linda and Tommy O’Connell who felt that Teddy would benefit from a household where there were consistent and strong pack leaders. Teddy also needed an environment where he was allowed to re-live being a puppy…. a phase that he missed out on in his previous home. Well, they were right. Teddy has been accepted by the O’Connell pack of three dogs as the irritating younger brother. Linda and Tommy have come to love Teddy and decided that he would join their family permanently. Aside from his penchant for toilet paper and his dislike of fireworks, Teddy has found his forever home. 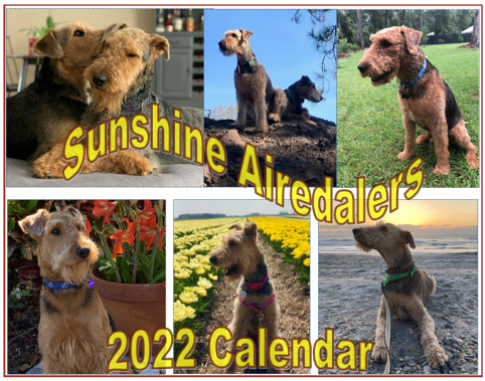 You can order our 2019 Sunshine Airedalers Calendar now! Donation per calendar is reduced to $10 including postage. Please purchase by visiting our Boutique page and using the Donate button there. 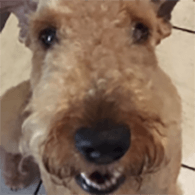 The mission of Sunshine Airedalers of Florida is to rescue, provide needed medical care, and find new, approved forever homes for those Airedale Terriers who are in need of help. We care committed to the successful placement of rescue dogs. We take pains to ensure that each dog admitted to our program finds a wonderful, permanent home. Please visit our Adoption page to learn more. We’re here to help! Please visit our Help page to find resources and information regarding Airedales and their care, including what to do if you’ve found a stray or need to rehome your Airedale.